with the wrong tools! 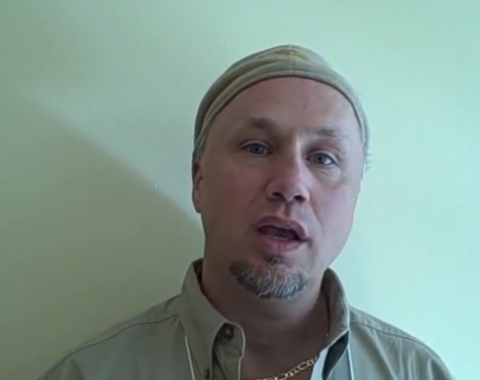 Get more FREE traffic & more hits! Support to JomSocial, Kunena, K2, Zoo & EasyBlog! 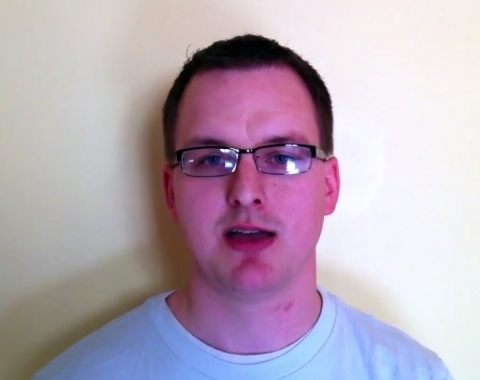 An SEO Course for the Busy Developer! 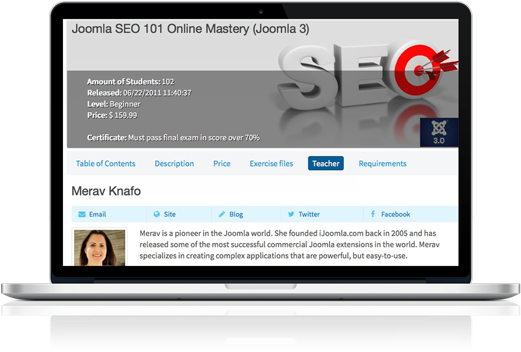 Save 95% Of Your Time Doing Joomla SEO! Don't waste your time taking the wrong actions Support to JomSocial, Kunena, K2, Zoo & EasyBlog! 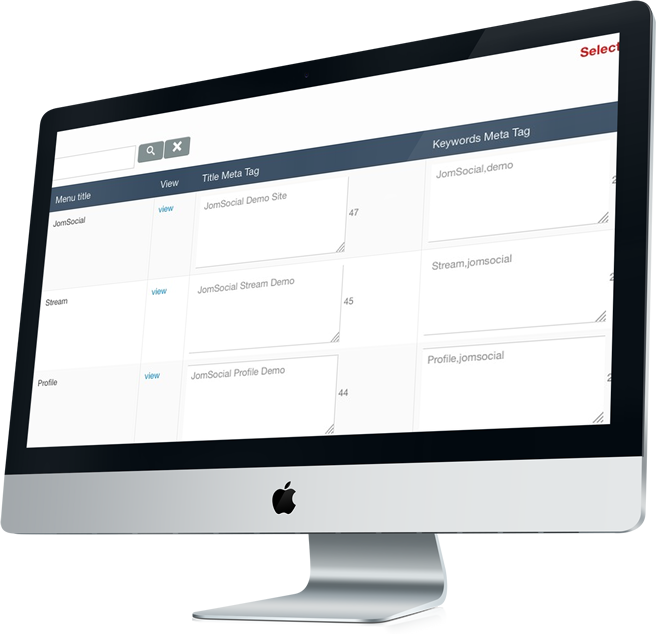 Manage all your meta tags on ONE page, and save 95% of your time doing Joomla SEO. 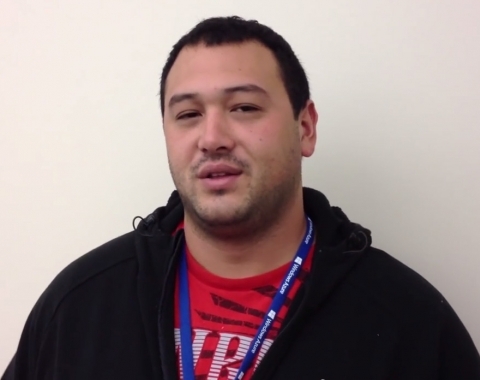 Our Metatags Manager saves 95% of the time you would have spent doing SEO on Joomla. It provides a single page on which you can see a list of all your articles and edit many of the keywords, descriptions and titles at once. 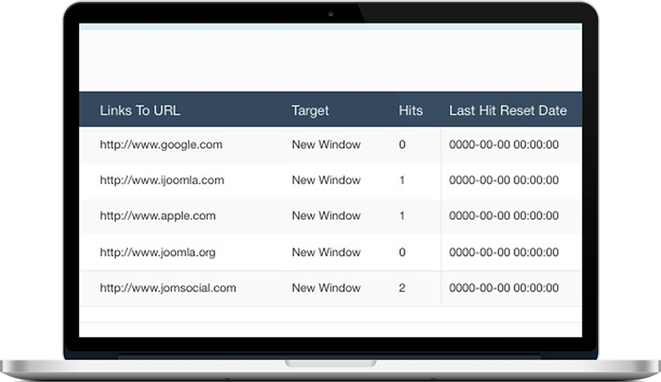 Our Joomla SEO plugin makes the usually tedious job of managing meta tags a breeze! 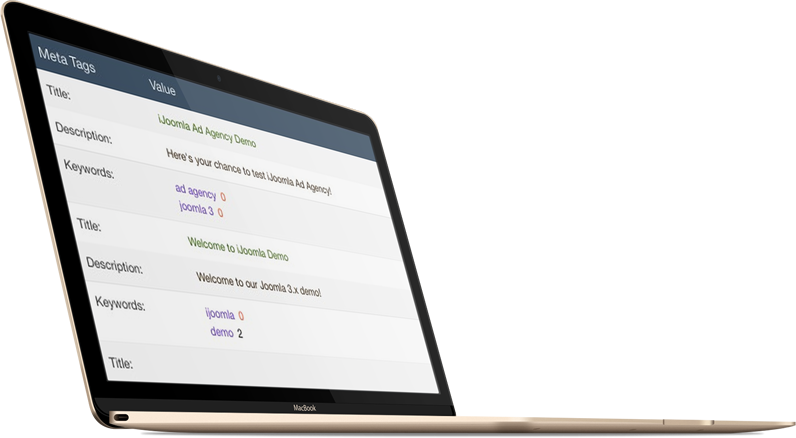 Perfect for on-page Joomla SEO, check for keyword saturation and more. These days, it's not enough to just have the keywords in the title meta tag. You must also add them in the body of your article at least four or five times to get the best results for your Joomla SEO efforts! Having too many links to other sites is bad for Joomla SEO and can hurt your Google SEO results. Now you can add a nofollow tag to links to avoid this problem. Have you ever wanted to know how your keywords rank on Google, if they're moving up or down, or where you stand in comparison with your competition? 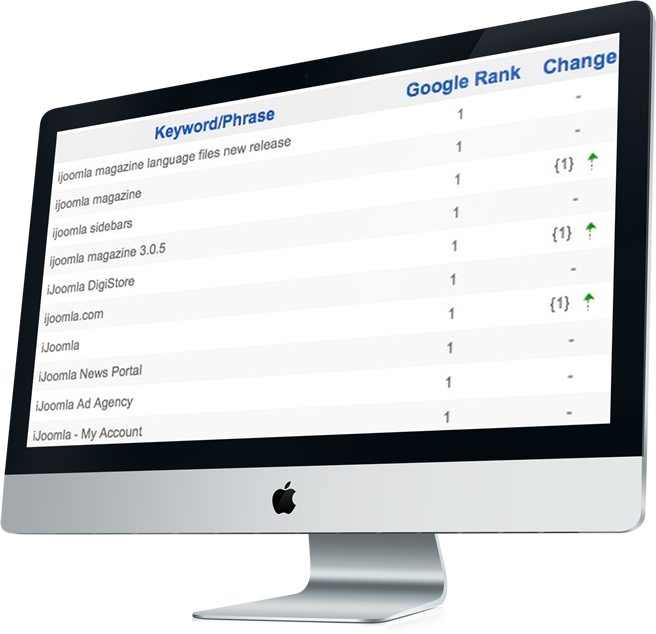 With our Joomla SEO plugin, you can track your keywords on Google, view stats of which keywords are up or down so that you can optimize them better using our on-page optimization tool. At a moment's notice, you can know exactly what is going on with your keywords and metatags. You can see how many keywords are up or down on Google. 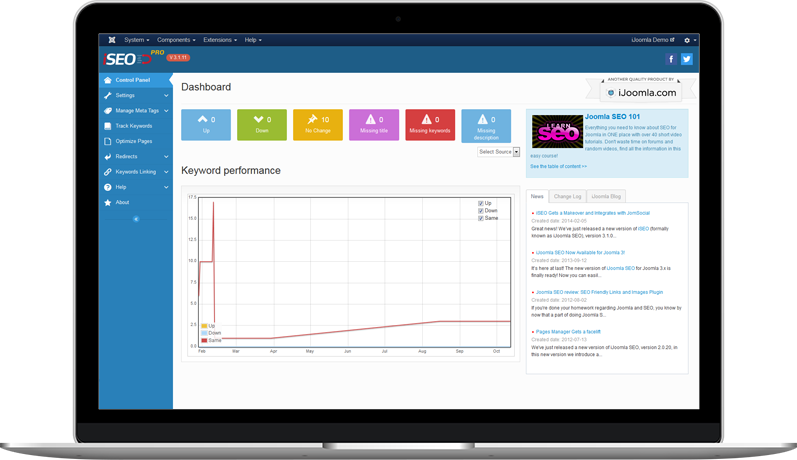 Our Joomla SEO plugin's dashboard is beautiful and includes statistics about the keywords you are optimizing for. These are just a few of the main features of our SEO for Joomla plugin. Click the button below to see all of them in more details and get on top of Google search results. you will have access to both versions when you purchase. 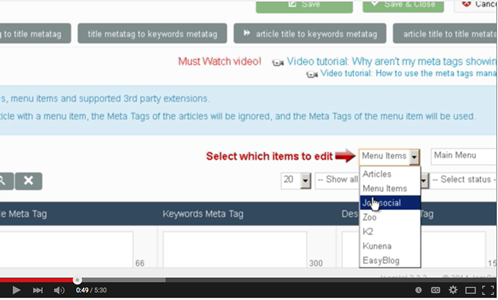 Easily edit meta tags of your JomSocial groups, events, videos and more! Get more FREE search engine traffic easily with this amazing integration! 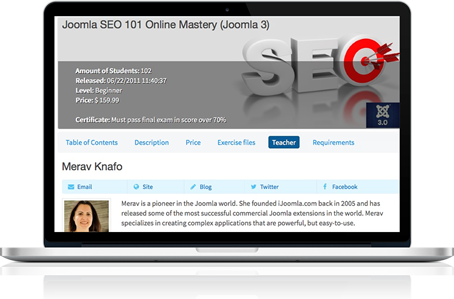 When you puchase iSEO, you get FREE access to this comprehensive Joomla SEO course! From writing meta tags, to redirecing www pages, it's all there!